Stand-alone single stage snow blowers are only powerful enough to clear light accumulation, but thanks to the power of the tractor, this attachment out-powers most stand-alone two stage snow blowers. The auger can reach a speed of 1,200 RPM, picking up snow and throwing it up to 40 feet away. This blower is purely gear driven, so there’s no need to worry about belts snapping during use. The skids on the base of the auger housing have 6 height settings from 0-2 inches, letting you skim off of the top of driveways or safely remove snow on top of gravel. The chute is adjusted using a handle that reaches the operator’s position so you can make adjustments on the fly. BCS offers the single stage blower in 24 and 28-inch widths. This attachment requires either a PTO extension or a Quick Hitch to connect to your tractor. Need more power than the single stage blower can deliver? The two-stage snow thrower has a 23-inch intake height and a 15-inch diameter auger to collect deep snow accumulation, while the impeller pushes the snow through the chute, propelling it up to 45 feet away. Power is transferred between the impeller and auger using a cast iron gearbox. It has the same adjustable skids as the single stage blower. Working around curved landscape features and tight areas? Replacing the skids with the included adjustable rollers makes the tractor easier to turn. 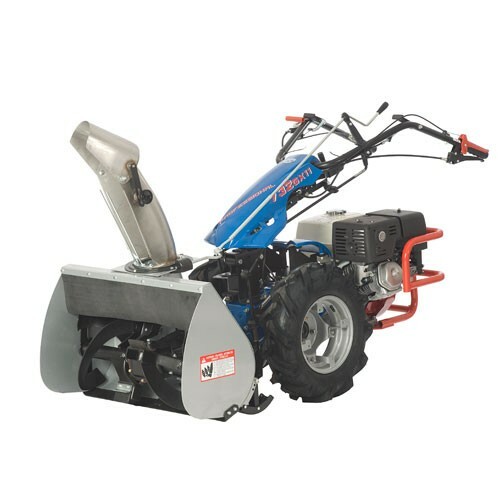 This snow thrower is available in a 28-inch wide version that’s compatible with 739 and larger tractors, and a 33-inch wide version that works with 749 and larger models. While it may look like BCS’s dozer blade, this 40-inch blade is curved differently to roll snow without sticking. The pitch of the blade can be adjusted to gather more snow with each pass or push it further. Like BCS’s snow blower, the blade is mounted to adjustable skids that let it be used on pavement or gravel. There’s also a non-metallic cutting edge available that picks up surface accumulation without damaging sensitive surfaces like granite. BCS recommends installing wheel weights to balance out the weight of the attachment and the snow it collects during operation. BCS’ newest attachment has a wide rotary brush that scrapes off surface snow to get a clean surface. By removing the last bit of accumulation, snow can’t pack down and turn into ice, making pavement safe to walk and drive on. The power sweeper rolls on a pair of caster wheels that can be height-adjusted using spacers, while the angle can be adjusted from the operator’s position using the control lever. The sweeper attaches with a swivel joint, letting it track the ground independent of the tractor to get a clean finish on any surface. The heavy-duty bristles on this machine are good for more than just snow. The sweeper can also be used to clean up debris on parking lots, industrial flat roofs and construction sites, and it can dethatch lawns without damaging grass. Wire bristles are available for heavy-duty cleaning jobs. Power sweepers are available in 30, 40 and 48-inch widths. This kit adds 10-12 lbs. to the auger housing, balancing the tractor for more stability when climbing hills. BCS recommends installing the kit on models equipped with a Honda GX390 engine under all operating conditions, as the added weight of this engine can make the tractor feel imbalanced. Need more traction on slick surfaces? BCS offers tire chains that fit every stock tractor wheel and tire combo from 4×8 to 6.5×12. 5×12 and 6.5×12 chain sets can be used with spider bungies, which stretch over the sidewall to create uniform tension across the chain. This increasing chain life by up to 25%. Want to Get More from Your BCS Tractor? If you need something for your BCS tractor, go to Shank’s Lawn Equipment. As an authorized dealer for BCS and their manufacturing partners, we don’t just sell them, we also offer service and parts for tractors, attachments and the engines that power them. Stop by our shop at 4900 Molly Pitcher Highway in Chambersburg, PA. To get here from I-81, take Exit 10 to Marion. Need something for your tractor and don’t live nearby? We ship OEM parts and accessories across the USA and Canada. To order, visit www.shankslawn.com. This entry was posted in Uncategorized and tagged BCS Snow Blower Attachments, BCS snowblower, BCS snowblower accessories. Bookmark the permalink.